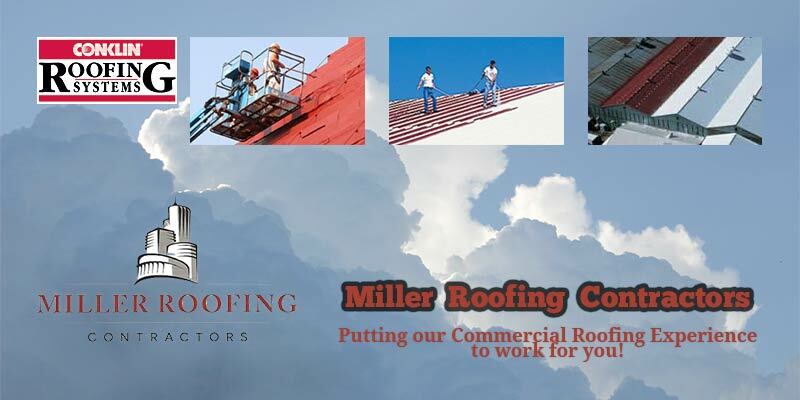 When you’re in need of commercial roof repairs, Miller Roofing Contractors should be your first and only call. We get the job done right the first time! As a Conklin independent business owner, we have been in business for more than 40 years and have covered more than 2.7 billion square feet. Now that’s experience! You can always count on our professional roofers to get your commercial roof repairs done right and in a timely manner. Our success depends on our customer’s satisfaction, so you can rest assured that we won’t let you down! Commercial roof repairs are one of those things that require a professional service to be done safely and correctly. After all, a roof isn’t just a roof; it also protects everyone and everything you have inside your building. Our tested and proven Conklin roofing systems are designed to offer superior protection against the elements, including hurricane-force winds, and be noticeably energy efficient. Having dependable roofers is just as important as having a dependable roof. Our skilled roofers will sit down with you and offer one-on-one recommendations and advice to fit your needs and your budget. We can look at your roof, make our assessment, and then explain everything to you so you understand what needs to be done and why. Commercial roof repairs shouldn’t be such a hassle that you put it off until it’s too late. That’s why Miller Roofing Contractors are here to help. We proudly serve the Knox, Licking, and Muskingum County areas. Give us a call today at 740-404-3390, and let our experience work for you! This entry was posted in Central Ohio, Commercial Roof Repairs. Bookmark the permalink. Follow any comments here with the RSS feed for this post. Both comments and trackbacks are currently closed.